Over the past few years, GSA IT has seen GSA adopt a centralized data-driven approach to information management at the senior executive level and throughout the business lines. We helped steer GSA toward this approach by focusing on three areas: governance, technology and culture. We built the foundation for stronger data governance by establishing a Government Wide Data Steering Committee, known as the SteerCo, to help inform business executives on the status of data activities. To support priorities of the SteerCo, we then stood up an IT Data Strategy working group so that GSA IT could build a single, consolidated technology platform with controlled processes for data access. Finally, we formalized a Data Analytics Working Group where anyone from across GSA working on data analytics and visualization projects could come together and collaborate on ideas. From the technology standpoint, we continued to build on the initial success of the Data to Decisions (D2D) platform by migrating it to the cloud and expanding the training program to include additional tools. With technology constantly evolving, we continue to strive to ensure we meet customer needs. Traditionally, IT requirements initiated from business problems. After the long arduous process of receiving the necessary funding to finalize the procurements, the work began in IT and once the product was completed, we passed it back to the business. We are now shifting, to provide the business with the platform, tools, and training needed for their business analysts to access and conduct their own data analysis and reporting without as much assistance from IT. We have legacy tools and processes that are still being used and valued, and while we are committed to making sure these tools are supported, we must also recognize that our business partners are becoming increasingly tech savvy. We have seen an uptick in the request going from “build me something that does this” to “give me access to the data and to the tools so I can build something myself.” While we are committed to adapting to this culture of self innovation, we must do so while maximizing resources, maintaining a strong security posture, reducing redundant efforts and increasing our data quality. How Do We Know Self Service Demand is Growing? 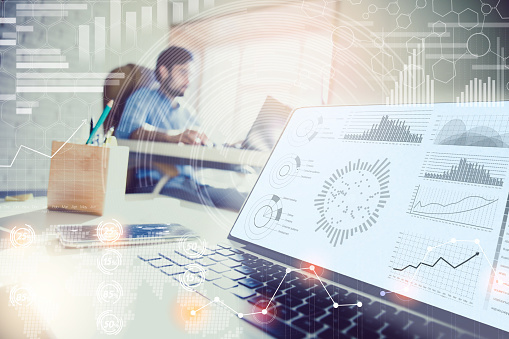 Business analysts are becoming more tech savvy and have greater demands for deeper and more real time knowledge to present insights to management. Not only is GSA IT continuing to receive requests for additional training on tools that were introduced over the last few years, we are also seeing an increase in the use of the D2D platform as well. For example, in FY16 we trained 300 GSA employees on analytics software. In FY17 we added another 250 people with a few dozen completing expert training sessions. In FY18 we are expanding the program to include more sophisticated analytical tools, open source programming software, and drupal content management. The enhanced training program will give super users the ability to do even more self service and have more ownership of their data products. We are also planning to train users on how to do proper access management, so that they can learn how to grant access and share insights in a secure way. In addition to the increased demand for training, we have also seen a rapid increase in GSA employees logging into D2D. In FY16 when we launched D2D, we capped out at 920 unique users. During FY17, we saw an increase to 7,900 users and for the first quarter of FY18, we have already had over 7,200 unique users log in. While D2D was primarily built to support internal data sharing across business offices and the CXO community, we have seen D2D expand to external agencies as well. Of those 7,200 unique users that have logged in so far in FY18, 5,800 were from external agencies. D2D is marketed as a self service analytics platform that allows individuals to create, post and share their insights. While it is not a requirement to leverage D2D, organizations continue to expand their use of this platform as they view it as a centralized location to create and share their data and visualizations from start to finish. While some organizations have more active users, we have seen every office across GSA begin to engage, share information, and access content on the D2D Portal. The reason for this adoption, in my opinion, is because the demand for faster and more accurate information continues to grow and this is driving a shift in the way business and program analysts interact with technology. They are being asked to provide near real-time answers to questions or theories, which require them to be able to interact with and manipulate data quickly. Responding to information requests in weeks or even days is no longer acceptable, so dependencies on IT to fully support data transformation activities is not a viable options. Why Centralize Data Management Activities? If you are like me and agree that self service demands are growing, then the next step is to figure out our best way to support the approach. Because this is rapidly evolving area, GSA IT has noticed that in the absence of a centralized platform, small pockets of teams have assembled what I call “micro-analytic platforms.” The level of complexity varies from using basic Microsoft or Google capabilities all the way to establishing a homegrown mini-data warehouse that leverages analytical software and/or visualization tools. While these micro-analytic platforms may meet a specific need, they are less likely to have properly implemented security and privacy requirements, apply consistent business rules, and in some cases, do not leverage our systems of record applications. These deficiencies increase our risk of improper usage and/or sharing of data, degrades our data quality, and reduce our leadership’s ability to trust and use data for decision making. What Exactly do you Mean by “Centralizing Data Management”? The centralization of data management falls under three objectives. Our first objective would be to help our business partners establish and charter a formal “Executive Governance” Board. This board would be chaired by an appointed executive and would be charged with prioritizing data needs, challenges, and resources. The second objective would be to formally recognize data practitioners across GSA in a Data Practitioner Working Group. These individuals would be formally trained on use of the suite of tools included in D2D. Training would also encompass the softer skills such as how to effectively present analysis while focusing on the customer’s experience. It would be up to each Executive Governance Board to determine the number of employees they would have in their working group. These individuals would be the ones granted access to data feeds, analytical tools and training. By identifying the individual practitioners, we would be able to maximize resources, ensure security and privacy protocols are met, and create a formal environment to share ideas and analysis. The third objective would be to centralize access to analytic tools and data on what we are calling a Data Science Virtual Desktop (DSVD). In turn, the Executive Governance Board for each office would determine the names of those that would have access to the tools and data within a centralized area. What Can GSA Look Forward to in FY18? The Federal Information Technology Acquisition Reform Act (FITARA) has made it clear that CIOs are responsible and accountable for any IT product or service consumed by an agency. However, supporting a self service culture makes it increasingly difficult to tell when IT ends and business work begins. In order to ensure we are doing everything we can to adhere to the laws requiring CIO oversight, we will emphasize the need to mature our governance process. The Chief Data Officer will work with our business partners to help them stand up Executive Governance Boards and will partner with the boards to provide oversight and structure for self service capabilities and the training program. In addition the Executive Governance Boards will be charged with formally establishing a data analytics working group and identifying individuals that should be provided access to GSA IT’s centralized data analytics platform, software tools, and training program. In 2018, our goal is to continue centralization and to enhance the capabilities that allow individuals to be innovative, creative, and interactive with GSA data while also increasing our security posture by automating role-based access and sharing capabilities. To that end, we will continue to educate, train and listen to our business partners to make sure we accomplish this goal together.